Unfortunately, due to sales rights restrictions, we cannot offer A Want of Vigilance for sale in your country. The months after Gettysburg had hardly been quiet—filled with skirmishes, cavalry clashes, and plenty of marching. Nonetheless, Union commander Maj. Gen. George Gordon Meade had yet to come to serious blows with his Confederate counterpart, Gen. Robert E. Lee. "Lee is undoubtedly bullying you,” one of Meade's superiors goaded. Lee's army—severely bloodied at Gettysburg—did not have quite the offensive capability it once possessed, yet Lee's aggressive nature could not be quelled. He looked for the chance to strike out at Meade. In midOctober, 1863, both men shifted their armies into motion. Each surprised the other. Quickly, Meade found himself racing northward for safety along the Orange & Alexandria Railroad, with Lee charging up the rail line behind him. 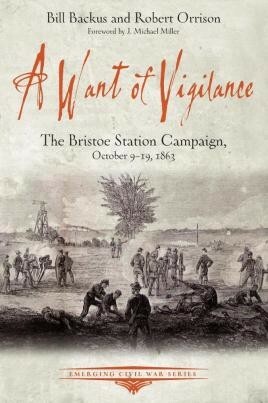 Authors Robert Orrison and Bill Backus have worked at the Bristoe Station battlefield, which is now surrounded by one of the fastestgrowing parts of Virginia. In A Want of Vigilance, they trace the campaign from the armies' camps around Orange and Culpeper northwest through the foothills of the Blue Ridge Mountains and along the vital railroad—to Centreville and back—in a backandforth game of cat and mouse: the "goggleeyed snapping turtle” versus "the old gray fox” pitted against each other in one of the most overlooked periods of the war. …an excellent short summary of a complex but often overlooked period of the Civil War. The tactical stalemates of Bristoe and later Mine Run led to the reorganization of the Union war effort in the East and the subsequent Overland Campaign of the Spring and Summer of 1964.